I pursue flexibility and convenience like it’s going out of style and online banking has helped me achieve precisely that. Yes. I’ve heard this several times, “Automation is the new discipline”. But it depends what type of automation we are talking about. There’s calling over the phone (as long as there are no costs) to pay your bills and then there’s fill out forms to authorize that the funds be withdrawn from your account monthly. Sometimes the offer to have the automatic withdrawals from your account comes with an “incentive”. Say you buy a brand new car for $25,000 with the interest rate at 2% for 5 years. This is a payment of $438.19. You are told if you signed up for automatic payments you would get .25 rate reduction. This would bring your rate down to 1.75%. You are excited; you just got a fantastic deal. Before you get too excited, this is a lower payment of $435.47 meaning a difference of $2.72 monthly. In a year, that is $32.64. In five years, $163.20. The day there is a glitch in your company’s payroll system because the new hire hit the wrong button or there’s a holiday and your paycheck wasn’t deposited into your account the day you were expecting (this happens a lot depending on holidays, or bad weather) you will spend half the day trying to contact every company on your automatic debit list to either a) not process the payment that day b) contact the bank to ‘reject’ the transaction. This would mean precious time wasted over the phone. There are greater things to be achieved in a day than spending time trying to stop the chaos that is about to unfold in your checking account should those payments come through and bounce. Also, a one time stop may not be effective right away. Oh noooo! You may be told to allow up to 3 business days for that to take effect. This is not free either; there could be a stop payment fee an average of $25. A bounced transaction fee or insufficient funds fee (average of $30) goes both ways. So you and the company you’re paying get charged. Of course the company will pass their own fee plus any late fees to you. One bounced transaction fee of $30 has wiped away any “savings” you thought you were getting. If this happens say 3 times in a year, that’s $90. Oops! There goes part of your five year $163.20 savings. Technology has allowed convenience but you cannot put your life and in this case, your accounts on cruise control. Signing those forms is like giving strangers the key to your apartment and assigning days they can come into your home. Well, the strangers already have the key. In some small ways, you are losing control of your account. Collect the payee’s information i.e name and address and add them to your checking account Bill payer. This will allow you sit and review your account each time you have to make a payment to ensure that the funds are actually there. Ask the payee what methods they accept payments i.e checks, cash, over the phone with a debit or credit card (in case you’re at crunch time). If over the phone, is there a fee? Ask if the company is on the electronic network. Electronic network means that the payment will get to the company within 1-2 business days. If they are not, this means the Bill Payer is sending a check. This could take 5-10 business days depending. Note: if you are making a payment to a credit union, they are most likely not on the electronic network. What dates the payment is due and the grace period if any; this is VERY important because life happens. You know, we go on vacations and in a bid to escape reality, forget our bills hoping there’s a magic wand somewhere we can wave 3 times and ALL our bills would disappear upon our return. If after reading this, you are still convinced automatic debits is the way to go, that’s fine. Personal finance is what it is personal. Be sure to look into your bank’s overdraft protection program at least so that your transactions don’t bounce and you don’t incur fees. While I don’t fill out debit authorization forms, I always fill out credit authorization forms i.e tax refund, direct deposit, basically any form that puts money into my account. Yeah baby! More credits please! 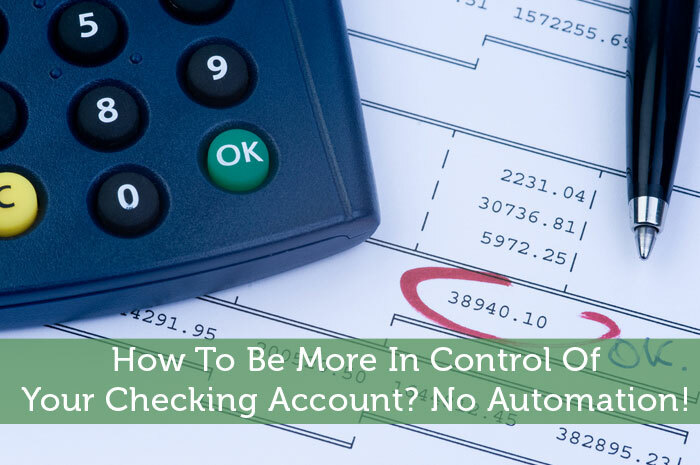 How To Be More In Control Of Your Checking Account? No Automation! When we went to Alaska for a month a few years back we automated a bunch of our bills so they would get paid during our absence. I never switched back and I really like not having to remember all the due dates. I know I could enter them on the bill payer service as a recurring bill but the amounts aren’t always the same. We have our pension check direct deposited and it hits the account the first business day of the month. I just make sure nothing comes out before then, plus we have a HELOC that we’ve never used that will cover anything that could get messed up in the scenarios you describe. That “benefit” costs us $20 a year but everything else about our account is free, so we figure we are paying $20 for piece of mind. It’s interesting that your bank allows the HELOC for overdraft protection. I’ve not heard of that before. Seems like what you have works for you then. I use USAA and their e-bill system does allow you to automatically pay bills that are not the same every month, like utilities. You put in a maximum amount so you don’t have to worry about bill errors. Let’s say my gas bill fluctuates between $15-$20 a month. I set my maximum amount for $25. Each month the bill is automatically paid. Then one month, for whatever reason, the bill is $50. Instead of automatically paying it, USAA will notify me that this bill wasn’t paid because it exceeded my limit. It is great your bank offers such notifications. But since the bill wasn’t paid because it exceeded your limit does the bank still charge you? If they don’t, does the payee charge you? Our health insurance forced us into automation, and I hate it! I am all for paying things online, but I’m a control freak…..Then, I had a paycheck direct deposit “glitch.” Our payment did not go through and we were unenrolled from our health insurance. We then had to pay a fee of $20 to be enrolled again, and they told us if we missed a payment again we could not be enrolled. How fair is that?!? It is unfair. No one should be forced into automatic debits especially in this day and age. Can you look into other options for health insurance? Keeping a buffer in your chequing account is another way of avoiding issues with delayed paychques. It takes a while to save up a month’s expenses in chequing (it took me almost eight months to save up, personally), but once you have that money built up, your expenses are already covered from last month’s paycheques going forward. Also handy in the case of layoffs – you’ve got enough money to get through the next month, before unemployment benefits begin to pay out. Yes Shoshanna! Keeping a buffer in your checking account is also a good suggestion. Setting up reminders work as well. But I refuse to fill out forms that allows a company take the funds from my account. Because interest rates are so low at the moment, I just keep a little extra in my checking account to cover mistakes like that. Or bank with somebody who has overdraft protection but doesn’t charge for it if you hold a savings account with them. While I don’t believe in automation for things like credit cards, post paid cell phone payments, or utillities (basically anything that could “accidentally” overcharge me I don’t want free access to my checking) but I’m not against autopaying for flat payments. If fears of payroll issues at work are a problem, join a bank that has free or minimal fees for accounts where a savings account acts as a buffer to the checking. It’s what I have with USAA and once in my life I experienced an overdraft and came out without a major fee (if any fee at all, I honestly can’t remember). Most credit unions offer such a benefit. Then you don’t have to worry about your student loan hitting an insufficient funds wall because you always have a small buffer in your savings! Funny, most of my flat payments (for me cell phone) gets automated to my credit card where I earn points. Whatever errors (if any) that occur, gets taken care of before the billing cycle. Credit card is someone else’s money. At least that is how I look at it. I automate certain things, like mortgage and investments but like to ”have control” over other things, like cell phone (which can vary a few dollars sometimes) and certain utilities. It’s all about what works for you! If my mortgage company would take accept a credit card on file to charge payments, I would gladly give it to them. But not my debit card. My cell phone bill rarely changes. If it does, it’s by cents. Besides, Tmobile is kind enough to send me a text of the amount they intend to charge. It is the reason they have my credit card on file. I love automation. I you are in control of your finances, meaning out of debt, budget, etc, automation can really make things easier. I certainly don’t let companies withdraw money without my permission though, outside of my mortgage. I don’t trust any of them enough not to screw it up. Great Article. Thanks for the info, super helpful. Does anyone know where I can find a blank credit authorization form to fill out? Hey kristian, I found a blank fillable “Hyatt Credit Card Authorization Form” here:Credit Card Authorization Form blank.